This is another picture book celebrating the wartime effort on both the frontlines and back home. Annie’s brother James is off to fight in WWI. 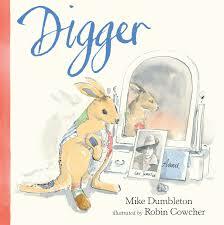 She bestows Digger, her small, hand-sewn toy kangaroo to him as a departing gift. Together, James and Digger set out across endless seas, under star-studded nights to foreign lands, wondering what is coming next. Together they endure life in the trenches on the Western Front in the second battle of Villers-Bretonneux in April 1918. After James is injured, Digger convalesces with him at a local farm where he meets Colette, a small girl that reminds them both of the Annie they left behind. James’ return to the frontlines and subsequent death in action sees Digger returned to Collette in a state of abject dishevelment. Collette lovingly restores Digger to his former glory and sends him home with a promise to keep visiting James’ final resting place. It is this heartfelt expression of caring that assures Annie that ‘far away, on the other side of the world’ someone really cared about James just as she did and still does for Digger. Digger is a tale that is both warm and wrenching. The image of the little patchwork kangaroo lingers as sonorously as the fact that not every solider, son, brother or mate made it home. Yet, this story is a tender and beautiful reminder of the deep connection Australia and the French town of Villers-Bretonneux developed and maintained after the successful recapture by the Australians on Anzac Day. 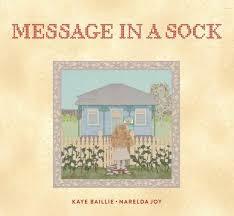 Deeply affecting and impossibly beckoning, this is a beautiful picture book to share at schools and at home. It is stupefying to think that in each Australian conflict from 1899 onwards, Aboriginal and Torres Strait Islander people have fought in every one. They fight for honour, their country, and sometimes just for the plain adventure of it. Yet until recently, recognition of their supreme efforts was never acknowledged. This powerful story gently unmasks this lack of appreciation by giving a voice to one Aussie indigenous digger, Alfred. 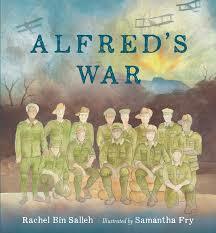 Alfred serves in WWI, returning injured to an Australia still embracing a white Australian policy. He attends the ANAZC ceremonies each year, he cannot forget the mates he fought alongside and, like the thousands of others who survived, not survived the horrible bloodiness of war, he struggles to shrug off the dark haunting shadows of past hostilities. He is ‘one of the forgotten soldiers’; the irony being that the hostility he faces in his own homeland sometimes outweighs that which he encountered on the battlefields. Poignant and confronting, revealing and decisive, this beautifully rendered story provides a fundamental link for children of any creed and background to appreciate the sacrifices and contributions made by indigenous people in the shaping of our Australian history. Suitable for lower to middle primary aged children. The most astounding stories undoubtedly are often the ones born of a true event. In the midst of a bitterly cold winter in France, little orphaned boy, Honore stumbles upon the Australian Flying Corps. He meets airman, Tim Tovell and is instantly engulfed in a world of caring and compassion. Tovell teaches the little Digger to box and ice-skate. Honore in turn keeps the camp free of marauding rats. After armistice is declared, Tovell must return to Australia. He is determined to take Honore with him and thus the two embark on a remarkable journey of concealment and daring, until Honore arrives in his new home to his new family. Suwannakit’s monochromatic graphite and watercolour illustrations perfectly mirror the sepia-coloured original photographs of airman Tovell and ‘Little Timmy’ incorporated throughout this book. 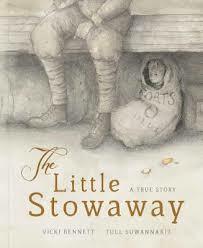 Filled with atmosphere and a sprinkling of whimsy they complement Bennett’s heart-warming narrative and paint a picture of a real-life wartime tale that many youngsters Honore’s age might have never been aware of. This story is an alluring commemoration of the ANZAC Centenary that provides an interesting launch into history discussions for primary school children. Whilst not strictly dealing with wartime conflict, Sorry Day is a compelling read addressing the past injustices of our Indigenous citizens and worth acknowledging during these occasions of remembrance. Maggie is a small child who has gathered with her mother and crowds of hundreds at Parliament House, Canberra to hear the auspicious public apology made to the Stolen Generations on behalf of the Australian Government on the 13 February 2008. In the press of legs and bodies, little Maggie slips and loses contact with her mother. She grapples frantically to relocate her and in those ensuing minutes of separation, suffers fear and panic, thinking her mother is gone. Her present day story seamlessly entwines with a similar tale of separation and loss, this one occurring many decades before, with the same devastating effects lasting several lifetimes instead of just minutes. Vass’ poetic prose, suffused with sensory detail so finely delivered you’d swear you can smell the camp fires of past generations, tells the story of hundreds of Aboriginal and Torres Strait Islander children forcibly removed from their families and communities by the Australian governments of the time from 1910 – 1970. The rationale behind the removals being that these children would prosper better from assimilation into a white society opposed to their own supportive and nurturing culture. 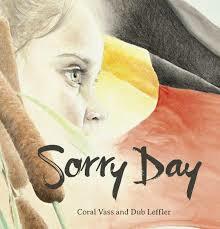 Evocative illustrations and a richly symbolic, touching story line cleverly interweaving past and present makes Sorry Day an absolute gem, definitely one to treasure. A detailed afterword supports the time line of the Stolen Generation and advent of National Sorry Day, which occurs annually now on 26 May. Vass and Leffler have handled this topic with extreme care, allowing raw emotions to speak for themselves to a generation (now) lucky enough to be relatively free from culturally damaging doctrines. Recommended for children seven years and above and to every Australian in the interest of cultivating forgiveness, empathy and understanding.